Home / Trading / Why Is Shopify Stock Holding Up While Others Can’t Handle The Turmoil? Why Is Shopify Stock Holding Up While Others Can’t Handle The Turmoil? Online spending remains not only strong, but robust with less than two weeks before Christmas. Like most of the markets, shares of Shopify (NASDAQ:SHOP) are well off the highs. However, unlike many names right now, Shopify stock is holding up well above its lows, as buyers continue to keep it afloat. Why is SHOP stock handling the turbulence so well while so many others are under extreme pressure? For the most part, we’ve seen a flight to safety trade in many U.S. equities. We’re talking blue-chip stocks with dependable dividends and strong balance sheets, including aames like Johnson & Johnson (NYSE:JNJ), Coca-Cola (NYSE:KO) and Procter & Gamble (NYSE:PG). However, we’re also seeing tech trying to rebound and, more specifically, e-commerce companies holding up well. That’s likely because online spending remains not only strong, but robust so far with less than two weeks before Christmas. Wayfair (NYSE:W) for one is doing well, while Amazon (NASDAQ:AMZN) is holding up above its lows. Not quite an apples-to-apples comparison, true, but it’s still worth noting. In any regard, are the shares of the cloud-based commerce platform a buy as it continues to hover well above its prior lows? Let’s take a look. To be sure, the biggest bear argument against Shopify stock is the valuation. Analysts expect the company to earn 31 cents per share this year, almost double 2017’s results. In 2019, expectations call for 122% growth to 69 cents per share. While this growth is strong, it leaves SHOP stock trading at 200 times next year’s estimates. Like many growth stocks, though, profits aren’t the focus at this stage of the game. That’s where revenues come into play. Right now, Shopify is expected to grow sales 57% this year to $1.06 billion, making for its first billion-dollar year. That’s a fantastic achievement, and while growth is forecast to slow in 2019 to 39.5%, analysts are still looking for $1.48 billion in revenue then. This still leaves SHOP stock trading at about 15 times this year’s revenue, which is certainly not cheap by most accounts, although the growth is impressive. The balance sheet looks better, with no short- or long-term debt and $1.5 billion in cash and short-term investments. However, I would feel better about Shopify stock if the company were free cash flow positive. At least then I would know that it’s able to finance all of its operations and investments and still put money in the bank. But that’s not the case here. Does the lack of positive free cash flow make SHOP stock a no-touch? Not necessarily. Just because the valuation is stretched and cash flow statements are far from perfect, there are two things we can’t ignore. The first is Shopify’s growth, which is great on both an earnings and revenue basis. The other is SHOP’s stock price, which continues to hold up well. Shares were rejected near $160 after the stock hit downtrend resistance (blue line). That mark has kept Shopify stock in check since summer, after the stock hit a double top near $175. The 200-day moving average has been a rough area of support, with the exception of the last two months. It also mirrors uptrend support (purple line) somewhat closely, a level that SHOP stock is now approaching. For short-term bullish traders, they may consider using a close below uptrend support as their stop loss. Should that occur, a decline into the $125-$130 range may be in the cards. 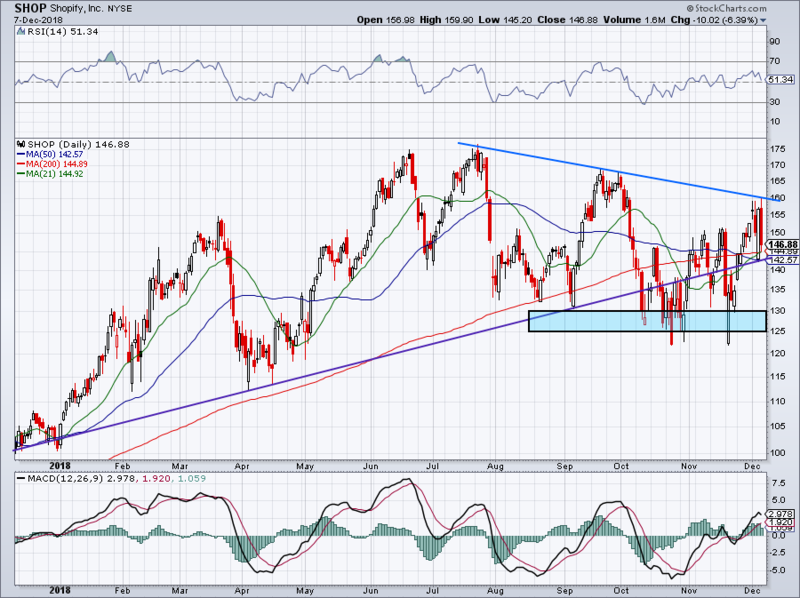 In the event that the market is able to rally, Shopify stock price likely has upside back to downtrend resistance. 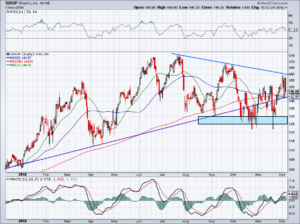 However, I would not consider this growth stock to be a valid flight-to-safety trade should further weakness ensue, even though it has held up well over the past few weeks. Article printed from InvestorPlace Media, https://investorplace.com/2018/12/should-i-buy-shopify-stock-right-now/.